UNITED NATIONS, Jun 19 2018 (IPS) - From “Africa Reeling” to “Africa Rising,” there’s a new narrative for the African continent, now showing promising signs of sustainable growth under more stable governments. Among the countries attracting investors are Côte d’Ivoire, Benin, Morocco, Rwanda, Senegal and Togo. But a new report from the United Nations Development Programme (UNDP) finds that Africa’s new wealth is increasingly concentrated in a few hands. Disappointingly, 10 of the world’s 19 most unequal countries are in sub-Saharan Africa. Economic inequality, sometimes referred to as income inequality, is the unequal distribution of a country’s wealth. In highly unequal societies, such as South Africa, most people live in poverty while a minority amasses enormous wealth. 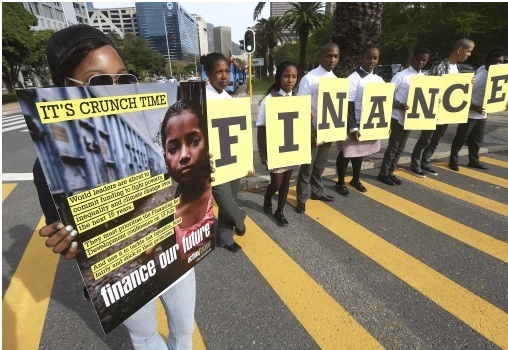 South Africa, the continent’s most developed economy, is also the world’s most unequal. Botswana, Namibia and Zambia are also among the top 19. While Ethiopia’s economy is growing at 8%, it is impossible to miss its impoverished citizens in the streets of its capital, pulling on donkeys to transport goods while the rich and famous drive around in luxury cars. In Nigeria “the scale of inequality has reached extreme levels,” reports Oxfam, a UK-based charity, in a study published in May 2017. Five of Nigeria’s wealthiest people, including Africa’s richest man, Aliko Dangote, have a combined wealth of $29.9 billion—more than the country’s entire 2017 budget. About 60% of Nigerians live on less than $1.25 a day, the threshold for absolute poverty. “Everything [in South Africa is] was skewed racially—education, access to finance, and access to land,” maintains Haroon Bhorat, an economics professor at the University of Cape Town. Several factors drive inequality in Africa, according to the group of economists who authored the UNDP report “Income Inequality Trends in Sub-Saharan Africa: Divergence, Determinants and Consequences”. First, under Africa’s two-track economic structure, growth often occurs in sectors characterized by low absorption of unskilled labour, high earnings inequality and high capital share in total income. The authors note that growth in those sectors may spur GDP headline growth but will also exacerbate inequality. It’s a rising tide that doesn’t lift all boats. Second, infrastructure, human labour and land are highly concentrated in Eastern and Southern Africa. Third, authors of the report make reference to the “natural resource curse, an urban bias of public policy and ethnic and gender inequalities.” It appears, they note, that countries with abundant natural resources, such as Botswana and Zambia, are also some of the most unequal. Inequality also results from regressive taxes [tax rate decreases when taxable income increases], unresponsive wage structures and inadequate investments in education, health and social protection for vulnerable and marginalized groups. In the 1980s and 1990s, many African countries buckled under pressure from the International Monetary Fund, the World Bank and Western nations to implement structural adjustment programmes (SAPs), which led to cuts in subsidies for health, education, transportation and other sectors that help poor citizens. Some historians and economists now say those cuts fostered inequality. “Under the influence of Western donors, austerity became African leaders’ default coping mechanism for periods of economic stress,” writes Nicholas William Stephenson Smith, a freelance researcher and historian. For many countries SAPs widened the wealth gap rather than providing macroeconomic stability, argues Said Adejumobi, director of Southern Africa’s subregional office for the UN Economic Commission for Africa. Adejumobi adds that structural adjustment stalled mobility, frayed communities and sharpened divisions along socioeconomic lines. Currently “a tiny group of 4% captures a large chunk of the income and wealth in Africa’s changing tide of capitalist progress,” he says. Inequality now threatens social cohesion on the continent. In recent months thousands of Ethiopians have been on the streets protesting harsh economic conditions, forcing factories, hospitals and public transportation to shut down operations. Expect deprived people to push back against inequality at some point, says renowned French economist Thomas Piketty, because the rich will always try to protect the status quo and resist efforts to achieve an egalitarian society. Piketty’s book “Capital in the Twenty-First Century” makes a moral argument against excessive wealth accumulation, describing it as unfair and unjust and something to be resisted. Countries adopted the Millennium Development Goals (2000–2015) to, among other targets, halve the number of people living in absolute poverty. Globally, after 15 years, some 50% of participating countries had met that target, 30% had made progress and 20%, mostly developing countries, had not made significant progress. The Gambia and Ghana met the target, but Ethiopia was among the countries that did not. The authors of Income Inequality Trends in sub-Saharan Africa argued that poverty reduction efforts do not necessarily bridge the inequality gap, which was a conceptual underpinning of the MDGs. To achieve the 2030 Agenda for Sustainable Development, an offshoot of the MDGs, experts hope countries will embrace a range of policies that tackle various forms of inequalities, not just poverty. “Policies that help reduce poverty are not necessarily the same as those that help reduce income inequality,” writes Abdoulaye Dieye, director of UNDP’s regional bureau for Africa, in the preface to the report. Quality education may dent poverty but will not close the inequality gap unless accompanied by “progressive taxation [tax rate increases with increases in taxable amount] and well-targeted social protection,” Dieye further explains. Also, countries need to focus on growth pattern rather than growth rate, because inequality falls when growth is in labour-intensive sectors, such as agriculture, manufacturing, and construction, and it rises when growth is in sectors high in capital and the use of skilled labour, such as mining, finance, insurance and real estate, according to the UNDP economists. Currently most African countries allocate a significant share of their national budgets to recurrent overheads and/or debts, leaving little or nothing for other projects. Corruption, mismanagement and illicit financial flows (IFFs) also deplete state coffers. According to a 2015 report by a high-level African Union panel on IFFs headed by former South African president Thabo Mbeki, Africa loses up to $50 billion annually to illicit financial flows. Mr. Mbeki urges countries to punish multinational companies that are over-invoicing, underpricing or funneling money to tax havens. “Gender inequality is costing sub-Saharan Africa “on average $US95 billion a year, peaking at US$105 billion in 2014—or six percent of the region’s GDP—jeopardizing the continent’s efforts for inclusive human development and economic growth,” according to the UNDP publication Africa Human Development Report 2016: Advancing Gender Equality and Women’s Empowerment in Africa. The UNDP correlates gender equality with human development. Mauritius and Tunisia Mauritius have low levels of gender equality and high levels of human development. Conversely, Chad, Mali and Niger have high levels of gender inequality but low levels of human development. Ayodele Odusola, the lead author of the UNDP report, maintains that no single solution can address inequalities on the continent. “You have to take countries’ context into consideration,” he says, advising countries to adopt progressive taxation, invest in education and agriculture, increase direct taxation and institute efficient tax administration. *Africa Renewal is published by the UN’s Department of Public Information.